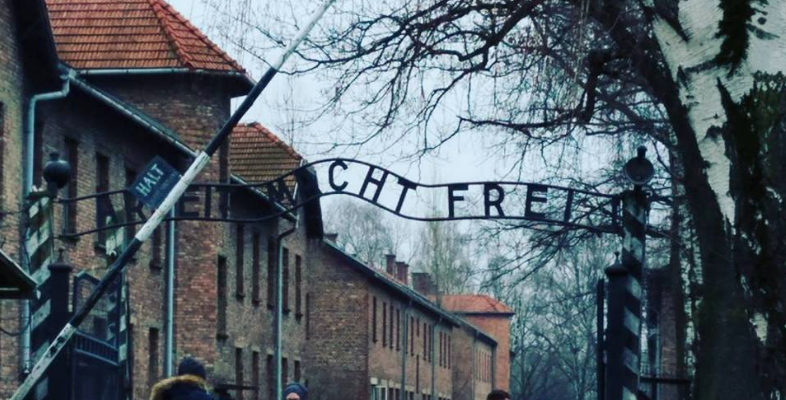 As someone who traveled to Poland this past December with the sole intent of furthering my Holocaust education, the news about the nation’s government criminalizing any claims of their complicity enrages and disgusts me. Before diving further into the specific issue at hand, I want to note that I am currently deep into a large-scale gonzo journalism project on my Living Links experience as a whole. I plan on expanding upon this very situation, and its sheer absurdity in the wake of what I saw, within that piece. However, I feel the issue is simply too important to not discuss in some capacity while it’s still floating in the news circuit. For those not as unhealthily obsessed with Holocaust history and contemporary Holocaust study as me, I’ll quickly summarize the specifics of the Polish president’s spineless maneuver. President Duda approved a new law making it illegal (punishable by prison time) to simply say that Poland had any involvement in Nazi war crimes. Essentially, the Polish government, in a cowardly attempt to alleviate their own guilt, is trying to replace fact with fiction. By punishing the account of a past that they aren’t quite proud of, they are beginning a campaign to rewrite their history. It’s true that Poland was under German occupation throughout most of World War II. I’m not going to sit here and argue that the Poles were the primary perpetrators of the Holocaust; we all know that wasn’t the case. But to say that they had no involvement whatsoever is not only an insult to Polish survivors, but to those who perished within the nation’s borders. When I’m standing in the square of a small Polish town, hearing recounts of Poles joining in on the Nazi slaughter of children, I’m not saying Poland was the primary perpetrator. When I’m standing in the Majdanek death camp, directly in front of me a mountain of Jewish ashes, and only a mile or two out stands a bustling Polish city that stood in that same spot 80 years ago, I’m not saying Poland was the primary perpetrator. When, after leaving a market filled to the brim with anti-Semitic caricatures of Jews and stolen pre-war Judaica, my friends and I get harassed (some beaten) by Poles simply for wearing Kippahs, I’m not saying Poland was the primary perpetrator. What I am saying, President Duda, is that you can’t sit there and say your people had absolutely no involvement in the genocide of my people. You can’t sit there and rewrite history to redact your complicity. A thriving Jewish community was decimated within your borders, that is fact. Poland, here’s my advice to you. When you are berated by the international community for your decision, don’t resist. Don’t fight back; don’t defend your decision. Redact your law, start educating your youth. Learn. “Those who cannot remember the past are condemned to repeat it,” (George Santayana). If you don’t listen, if you choose to forget, don’t worry. The Jews will always remember. I must point out my respect for your kindness for people who require guidance on in this matter. Your real commitment to getting the solution all around became really advantageous and has consistently helped professionals just like me to get to their ambitions. Your personal invaluable instruction signifies this much a person like me and a whole lot more to my office workers. With thanks; from everyone of us. I really wanted to type a small message to express gratitude to you for all of the great solutions you are showing on this site. My extensive internet research has at the end been compensated with reliable suggestions to exchange with my best friends. I ‘d assert that we website visitors actually are definitely lucky to be in a perfect network with very many outstanding individuals with beneficial tips and hints. I feel quite lucky to have come across your entire site and look forward to many more thrilling times reading here. Thanks once more for everything. Thank you a lot for giving everyone an extraordinarily pleasant chance to read critical reviews from this web site. It is usually so nice and as well , jam-packed with a good time for me and my office peers to visit your website at the very least thrice every week to learn the latest guides you have. And indeed, I’m at all times amazed concerning the good tactics you give. Selected 1 ideas in this posting are undoubtedly the finest we have all ever had. I am only writing to let you be aware of of the fine discovery my friend’s princess gained using your web site. She noticed lots of details, with the inclusion of what it’s like to have a great giving nature to get other people really easily comprehend various specialized issues. You actually did more than my expected results. Thanks for supplying these invaluable, safe, explanatory and also fun tips about the topic to Lizeth. That is very interesting, You are a very professional blogger. I have joined your rss feed and sit up for in quest of extra of your magnificent post. Additionally, I have shared your site in my social networks!